In order for a recording to become available for purchase, you must first upload the recording to Set.fm and then publish it. 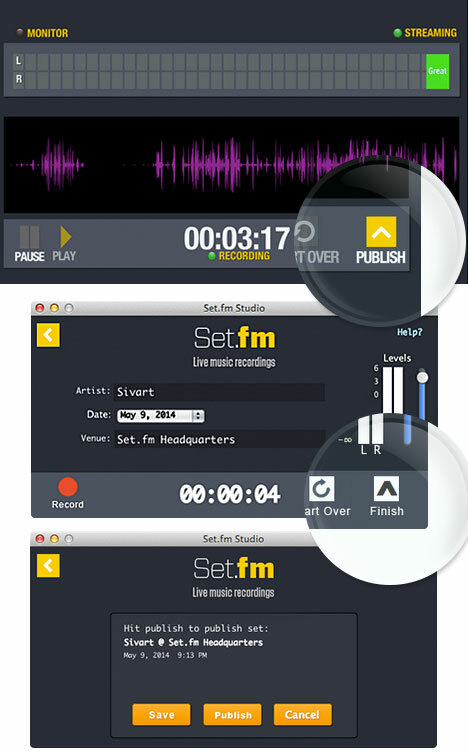 The process of uploading and publishing recordings to Set.fm can be done through either our Set.fm Studio applications or the Set.fm website directly. If you used the mobile version of Set.fm Studio to record your set then simply select the set in the app and tap the Publish button. If you recorded your set using Set.fm Studio on your Mac or PC, just click the “Finish” button after selecting your set. 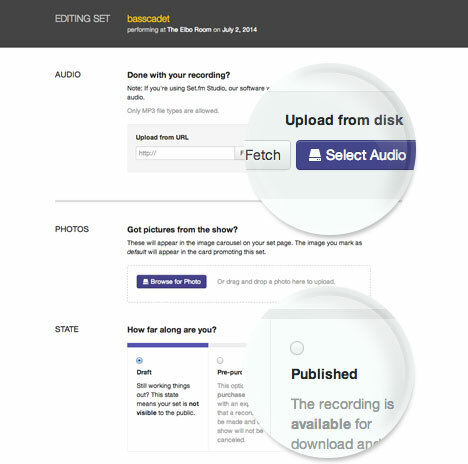 After clicking “Finish” you’ll be given the option to either Save the recording, which simply uploads the recording to our website but doesn’t make it available for downloading, or Publish the recording which uploads and publishes the recording as well. If you already have the audio file for the recording at hand you can use our website to upload it to us. 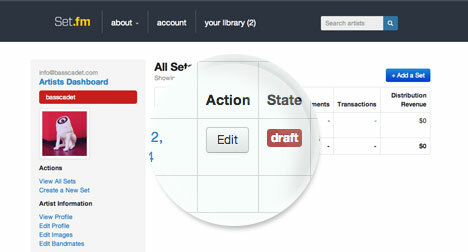 Click the “Edit” button next to the set in Artist Dashboard to be taken to the Edit Set page. Next, click the Select Audio button to choose the audio file and start the upload process. Make sure the audio file is an MP3. If you’d like to Publish the set and make it available to your fans select the “Published” state in the State section. You can always come back to this page and change the state at any time. Once you’re done, click Update to save your changes. On your profile page fans will get to preview a short sample of each set you’ve published. You’ll want to make sure that you pick the best part of your show to playback. You can change when the sample starts in the Sample section of the Edit Set page. 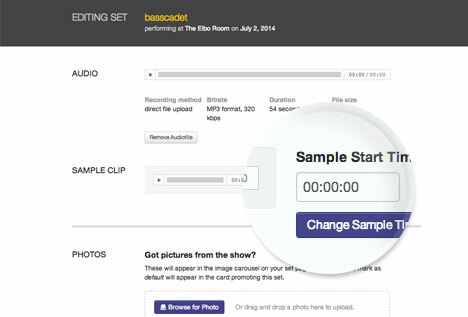 Enter a time in the Sample Start Timecode field and click Change Sample Time to update the sample.